Governments, NGOs and industry came together in March 2018 in Stockholm, to discuss the future of SAICM, as its mandate ends by 2020. 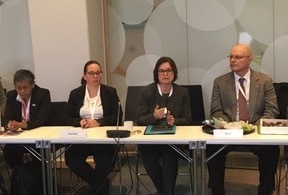 HEJSupport International advocated, together with colleagues in the IPEN network, for a future international chemicals and waste framework, which allows the highest level of protection for human health and environment. This should include sufficient financing, the possibility to tackle issues of concern, and implementation of ambitious goals and milestones. The Swedish minister of environment, Karolina Skog, called on governments to join the idea of a global deal for chemicals, similar to the Paris Agreement. The three days discussion was more a brainstorming around key elements of a future SAICM, rather than negotiations. The key elements that were discussed are: vision, policy principles, objectives and milestones, implementation arrangements, governance, and high-level commitment. The HEJSupport International co-director Olga Speranskaya was one of two civil society representatives who were invited to co-host the brainstorming session. On Wednesday a meeting with Gertrud Sahler, the SAICM president, IPEN and PAN was organized to exchange views on there important themes: financing, women and chemicals and highly hazardous pesticides. It was facilitated by the HEJSupport International co-director Alexandra Caterbow. The SAICM Secretariat will provide a paper, summarizing the discussions at IP2, as a preparation for the OEWG meeting in 2019. The discussion showed that the views of the delegations vary between a legally binding framework agreement and an enhanced version of the „old“ SAICM.